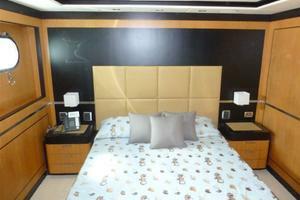 OWNER STARTING NEW PROJECT, READY TO SELL! 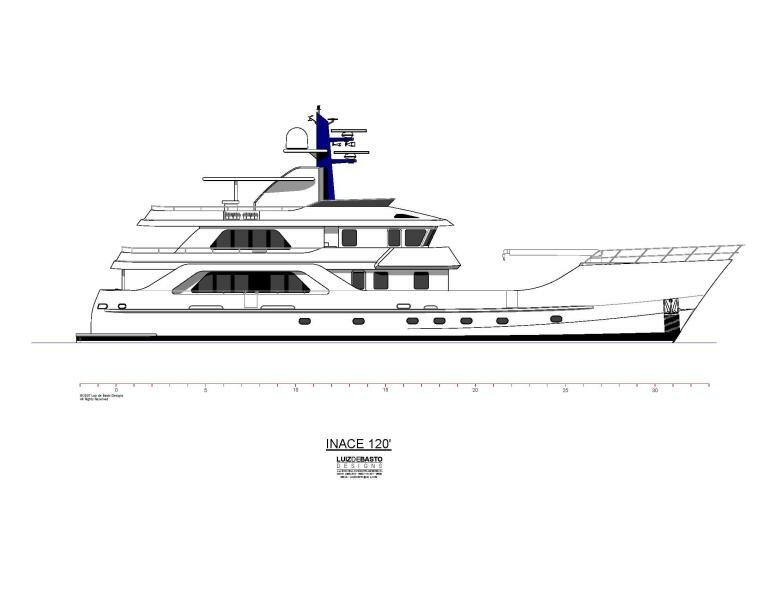 !Far Far Away build concept:The concept behind the design of Far Far Away was to create an Explorer Yacht that at 120’ has all of the features and volume of a much larger vessel in a size that is easy to manage and operate. 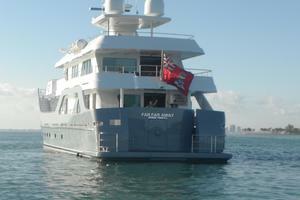 Far Far Away was created with extensive range to meet her mission profile.She needed to have excellent crew and guest separation, good crews' quarters were a MUST. 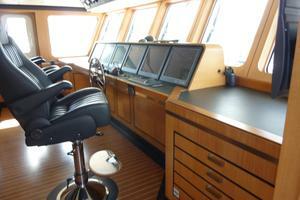 She needed to be easy to keep up and have reliable equipment and proven sea keeping abilities. Far Far Away needed to carry lots of toys and large tenders. 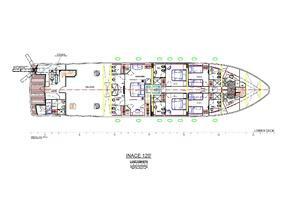 There needed to be extensive storage space for dry goods, frozen food and refrigerated goods.The engine room had to be large and well laid out with room to service all equipment in place and to remove major equipment through existing openings. 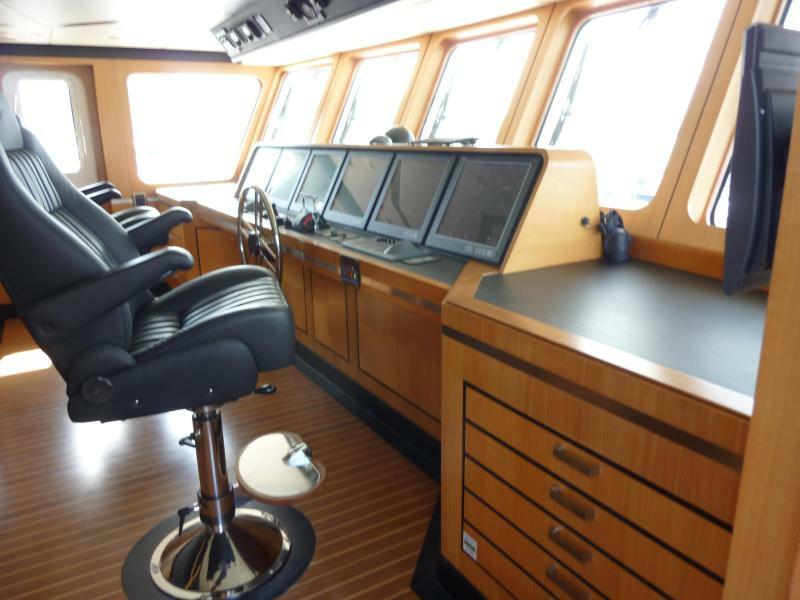 The equipment was chosen for durability and ease of worldwide up keep.The wheelhouse was designed for extended use and equipped for worldwide navigation. Being located in the center of the vessel it is well protected and sea kindly in all conditions.The owner’s stateroom is placed in the center of the vessel for maximum comfort. 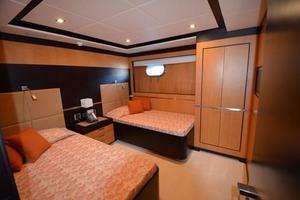 It is full beam and has extensive storage and hanging closet space for extended cruising. 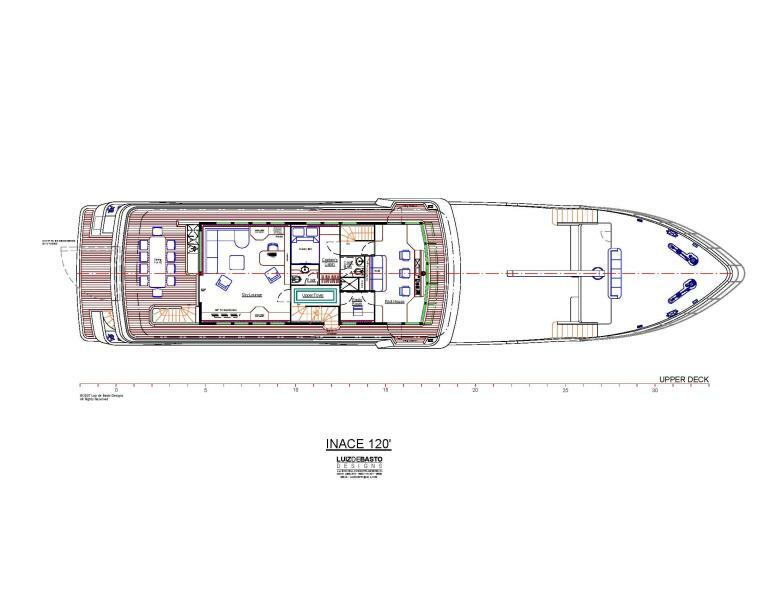 The guest staterooms needed to be large and have the amenities needed for guests to be comfortable in longer visits in remote areas.She has extensive deck and lounging space with a huge flybridge and lots of outdoor dining,She has a large professional galley designed to operate in all conditions with separate zones for the chef and stewardess.Every function and layout of the boat was designed around safety, comfort and ease of operation. 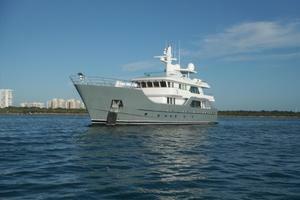 United Yacht Sales New Jersey would love to guide you through a personal showing of this 120' Inace Explorer 2012. This yacht for sale is located in Genoa Italy and priced at $12,595,000. For a showing please contact us by filling out the form on this page and we will get back to you shortly! 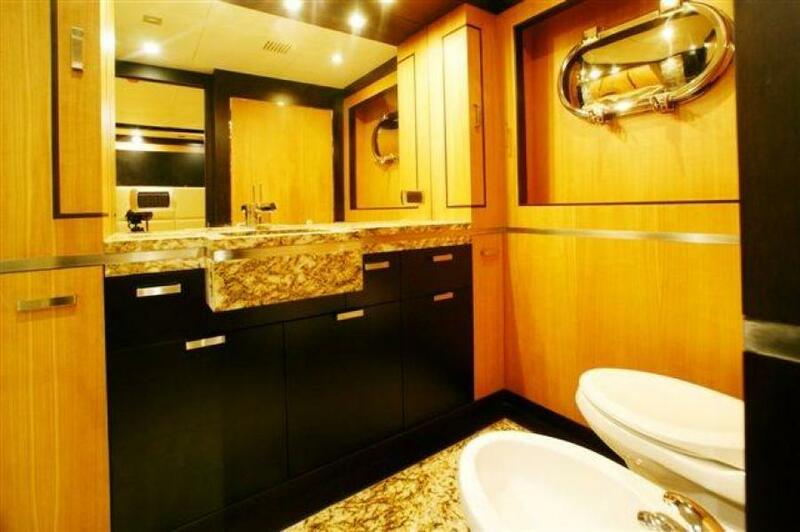 The accommodations on Far Far Away are much larger than you would expect to find on a vessel of this size.The interior is done in a golden light Anigre wood with dark wood trim and brushed stainless steel accent.The floor is in wood done in asquare pattern. 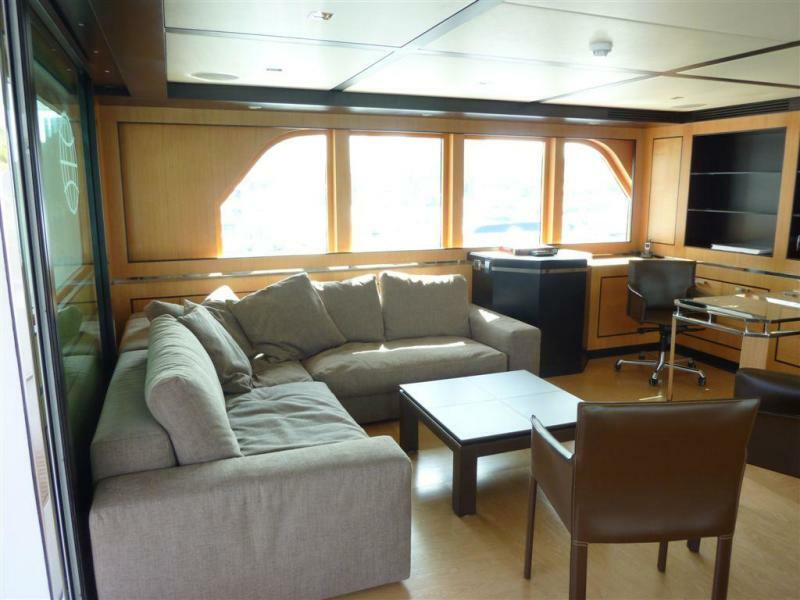 The effect is to give you a modern light interior which still retains a classic warmth.The large windows found throughout the boatbring the outside views to the guestswhile they enjoy the comfort of the interior. Entering the main deck housethrough theautomaticsliding aft deck stainless steel door there is a spacious lounge with seating to port andpop upTV to starboard. 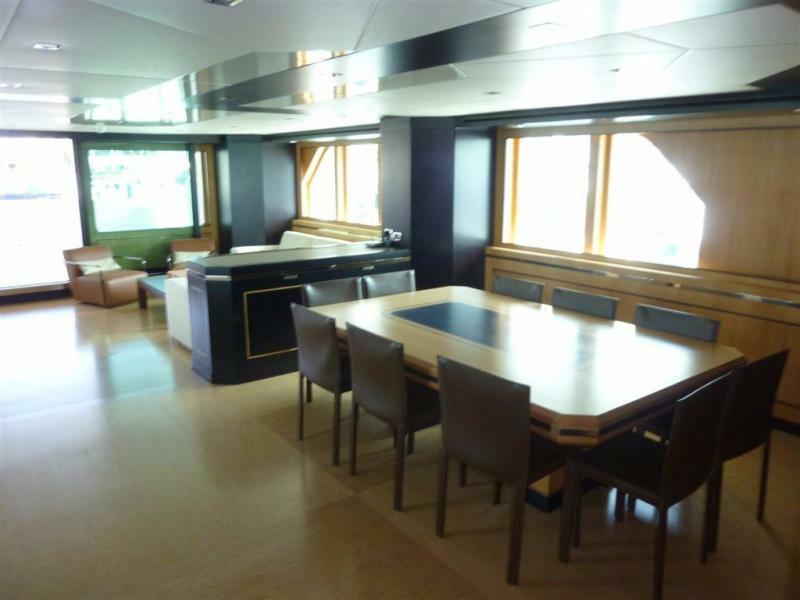 Next forward is a large diningarea with extensive storage and a large diningtable that comfortably seats 10 guests.The entrance to the galley is to port. You first enter a pantry that is fitted out with a large Euro cave wine cooler. 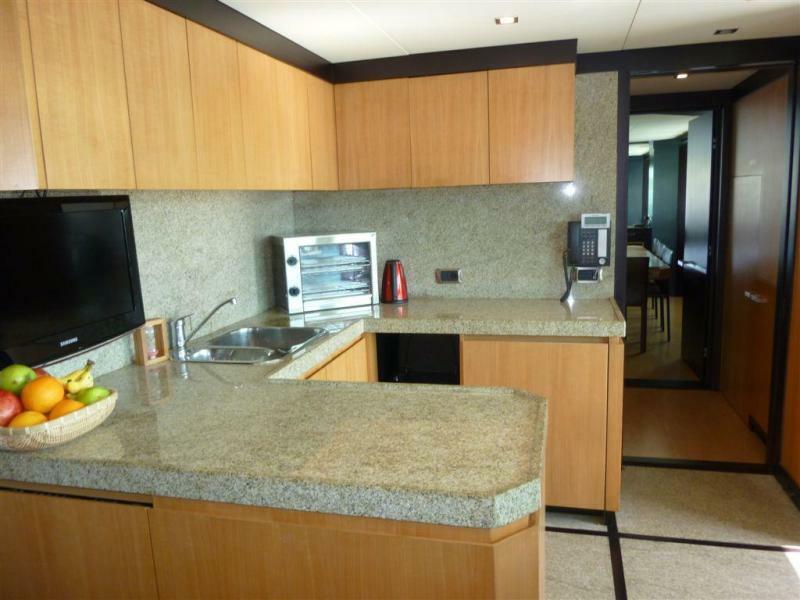 There is an under- counter milkfridge, drawers, cabinets and a granite topped counter withan espresso coffee station.There is a second door to enter the galley thatpreventsnoise from the galleyreaching the dining area.Entering the galleyto port you come to a separate and fully equipped stewardess station. She has her own double sink with disposal, Bosch dish washer,toaster ovenandtrash. 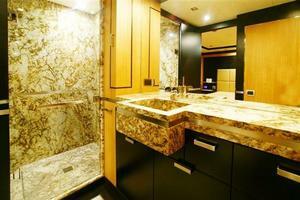 There is extensive drawer and cabinet storage. 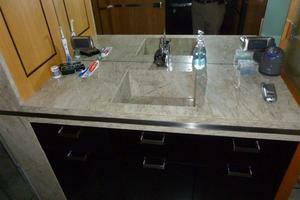 The U-shaped counter is covered in granite which creates a large counter space for plating and working. 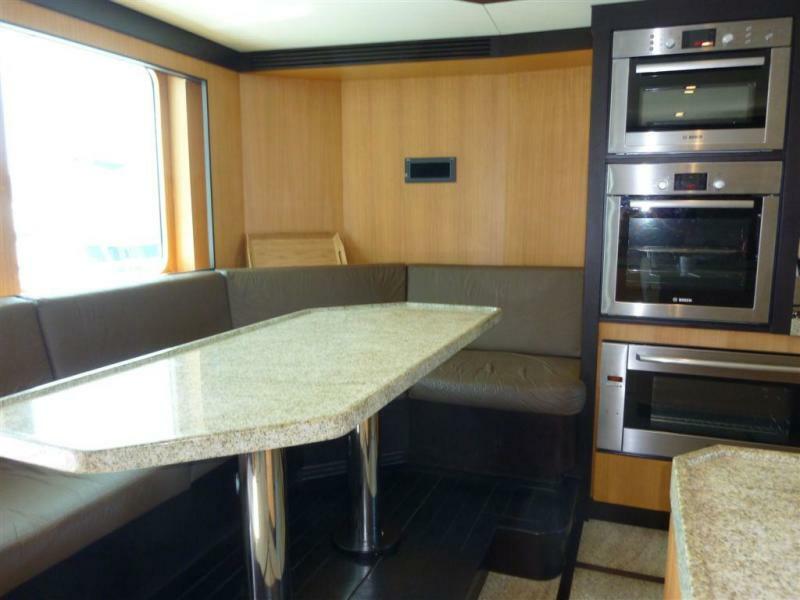 There is a monitor that can displayall cameras and ship's information facing the large crew settee with table to port forward.To starboard is alargechef's area with an 8burner Bosch glass cook top,triplesink with disposal,2Boschfridge/freezers, two Bosch ovens and a Bosch microwave. There are two large windows to port and starboard that create a bright working area.There is a direct entrance to the galley from the port side deck with a grate with drain just inside the door and justaft of the doorare thecrew stairs up to the captain's cabin and wheelhouse.These stairs, combined with the crew access corridoron the lower deck, allow the crew to movearoundFar Far Away without intruding in guest areas.This level of crew separation is something that is not normally found on a vessel of this size.To starboard forward from the saloon is the foyer,where one of 3 day headsis located.There are guest stairs leading up tothe skylounge and down to the guest accommodations deck.Forward on the main deck in front of the boat deck are two identical crew cabins with two upper and lower bunks with ensuite heads. Between them is a crew lounge with settee, desk and TV. 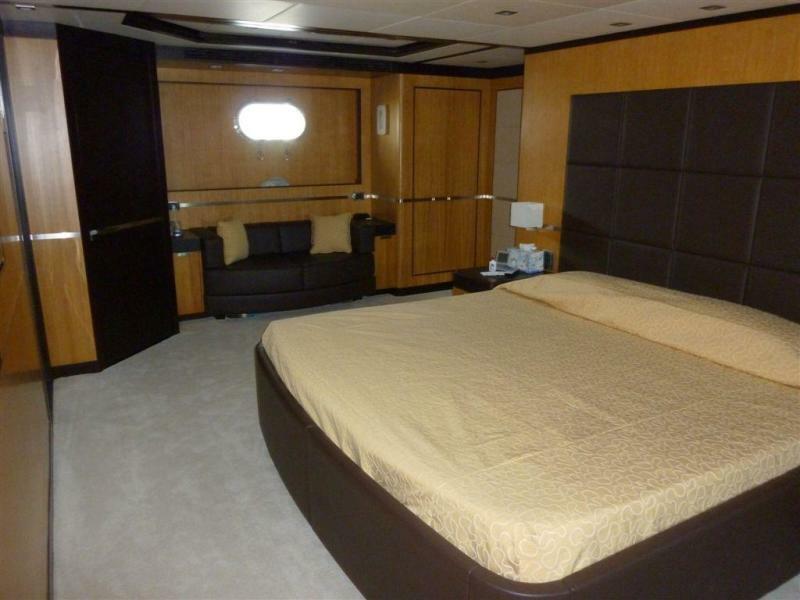 Stairs lead down to the laundry and access to the lower guest area.Located on the lower deck is the master stateroom, two VIP queen staterooms, two full sizetwin staterooms, laundry and extra refrigerator and freezer space.The full beam 26', master stateroom is in the center of the vesselfor maximum comfort and forward of the engine room so there are no shafts or propellers in the area. 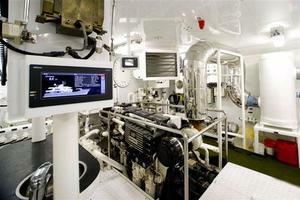 The master is separated from the engine room by double bulkheads that create fuel tanks and the master head. 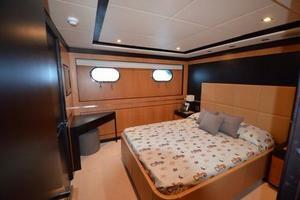 This stateroom is much larger then you would expect to find on most 120' vessels. 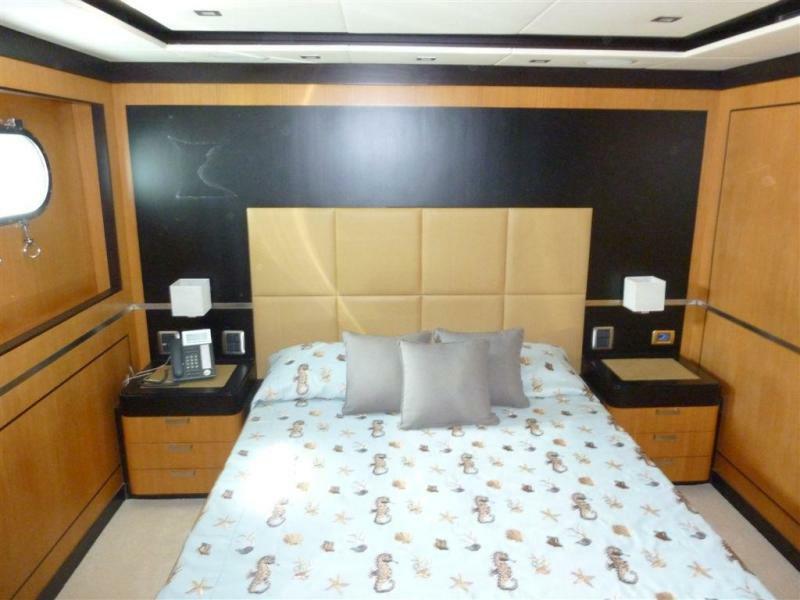 The master has a king size bed, two matching walk-in closets with built in drawers, shoe storage and hanging space. There are also two additional large hanging lockers. One of the closets holds the digital safe. 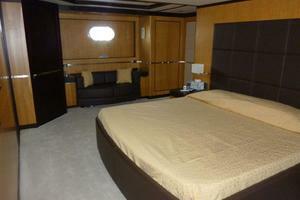 On the port side is a settee and to starboard is deck/dressing table.The his and her head is aft with large central shower. 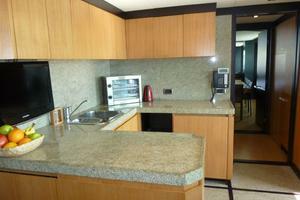 The head is done in Brazilian granite with stainless details. 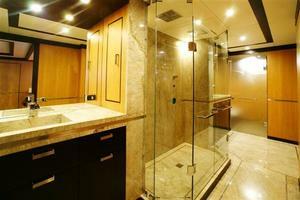 The his and her toilets are separated from the main head area andboth have abidet. 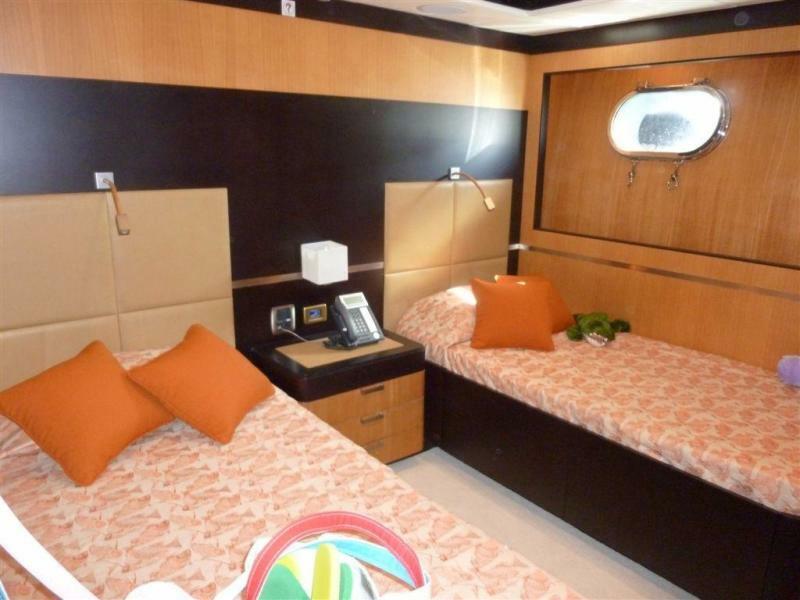 Next forward are the two identical VIP staterooms with queen beds with drawers under, desk and a large hanging locker with built in drawers, TV and sound system. 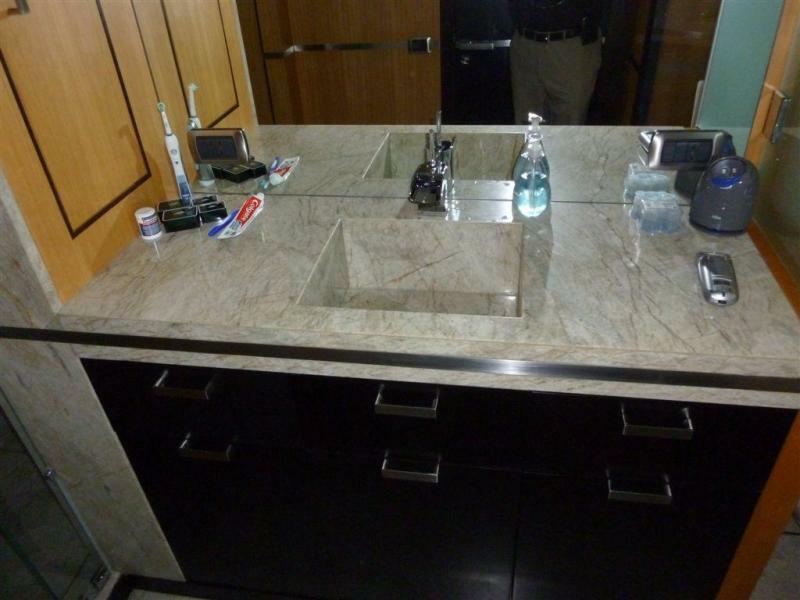 The digital safe is located in the closet.There are also drawers under the bed and a large head with shower all done in granite. Forward of the VIP staterooms are the two identical twin cabins, each with full size twin beds with drawers under the beds, hanging locker with built in drawers, a digital safeand a head with toilet, bidetand shower all done in granite. 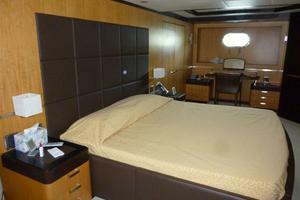 In the companionway between the twin cabins are 4 large drawers, two on each side for linen storage.Next forward is the crew service corridor that leads to the large laundry with twin full size washers and twin dryers. 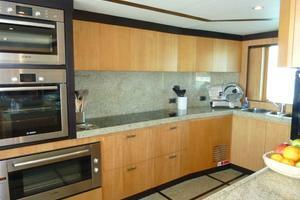 There is also additional refrigeration and freezers. 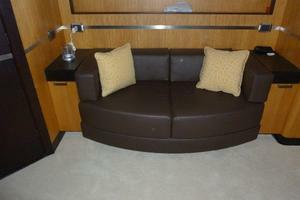 There is extensive storage in this area with storage under the floor, in closets and cabinets and a large linen closet. 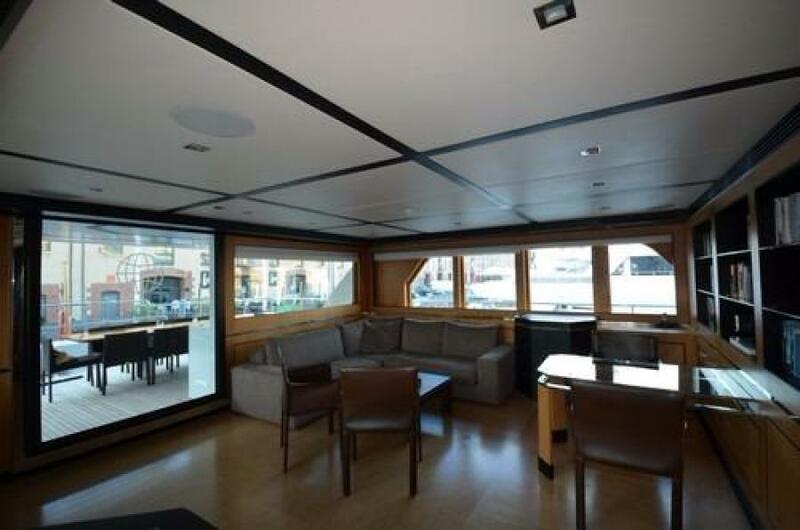 There is also a luggage storage cabinet accessed from the stairs leading up to the forward crew’s quarters.The pilothouse deck has a large wheelhouse forward with excellent visibility. 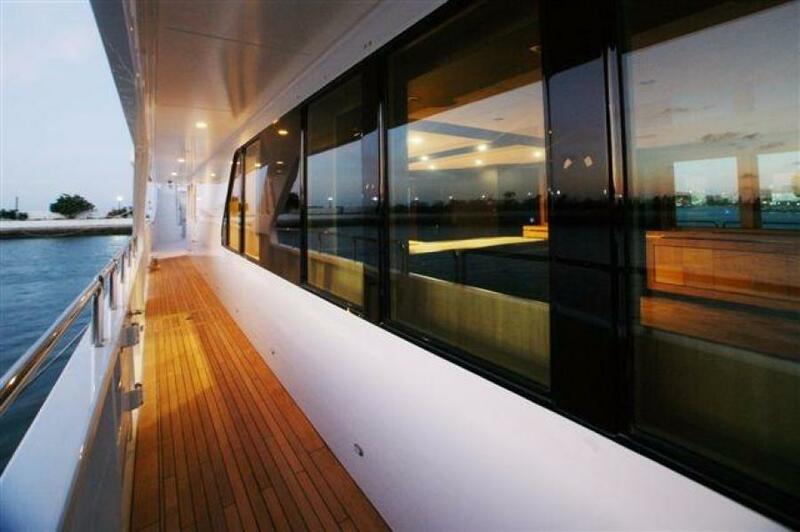 The forward canted windowsprevent glare for electronics and enhance overall viewing. 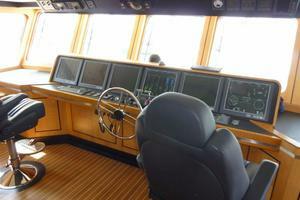 The pilothouse is fully equipped for worldwide navigation. 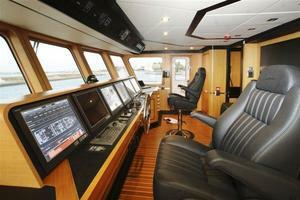 The main console has 6 19” Boning screens that can display data in a number of formats. 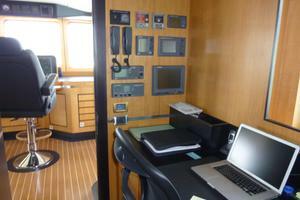 There are two navigation stations to port and starboard with chart drawers. There are two Opacmare helm chairs located to port and starboard of the helm and a large settee behind thechairs. 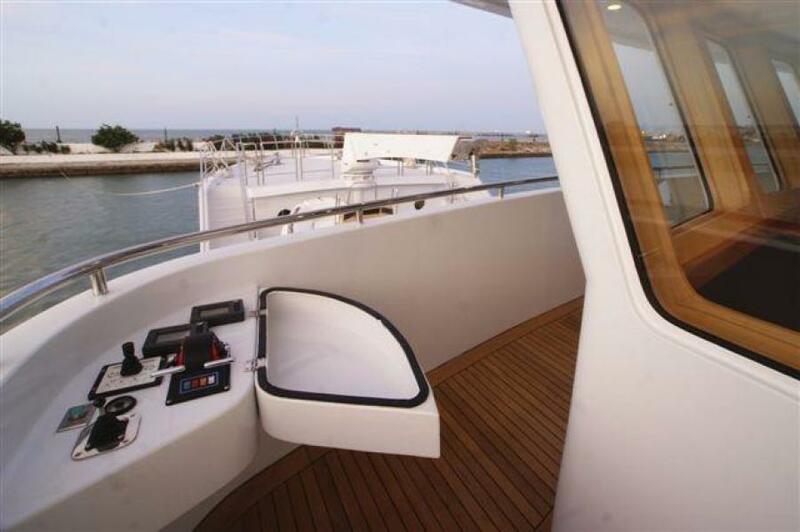 The vessel has excellent visibility andbecause the pilothouse is located at thecenter of the vessel it is verycomfortable in all weather conditions. 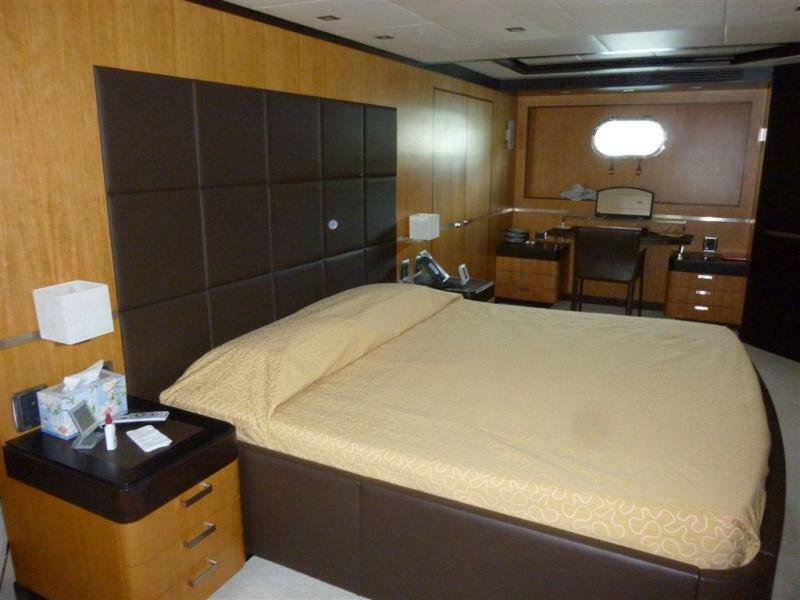 There is storage for navigation, class and operating required books and documents.There are port and starboard wing stations that bubble out to give the captain exceptional visibility down the sides of the vessel. 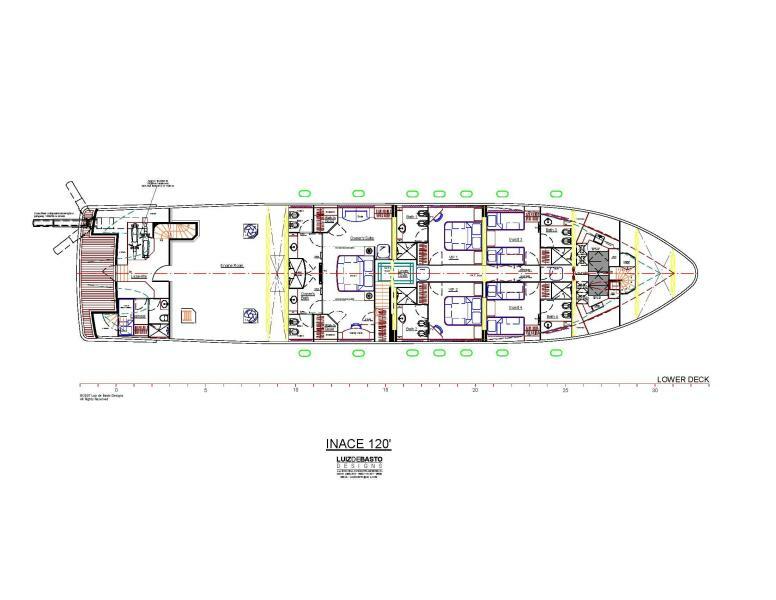 The stations have Cat engine displays, Kobelt engine controls, thruster control, horn, jog lever and rudder indicator.Inside to port is a passage that takes you to stairs leading down to the galley or to the Captain's cabin with double bed and ensuite head. 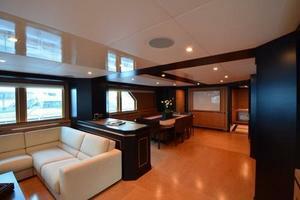 Aft on the starboard side is the radio room and access to the upper foyer with day head done in granite. 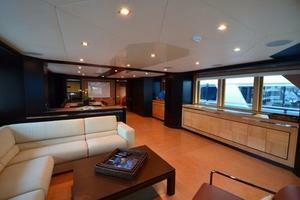 Next aft isthe comfortable sky lounge withlounge area, pop up TV, sound system anda office desk. 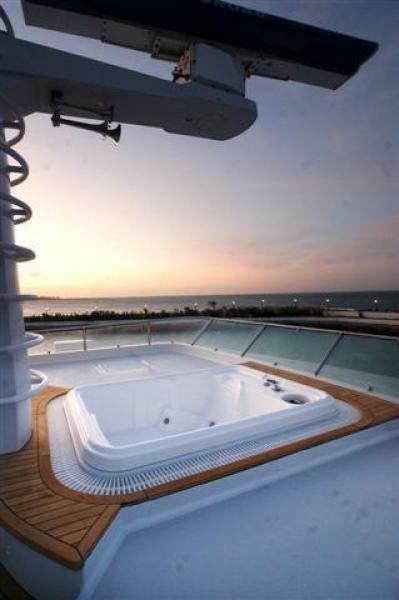 This is a wonderful space to relax. The low window lines bring the outside in and create a great feeling of space. 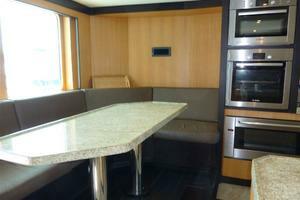 The aft skylounge has a large table for dining with wet bar with under counter refrigerator. 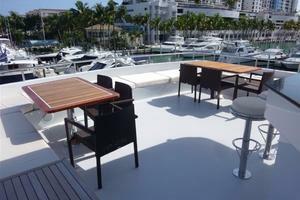 The open rails allow for excellent views while dining in comfort. There are stairs leading down to the aft deck and on the starboard side midshipsthere are stairs leading up to the flybridge. 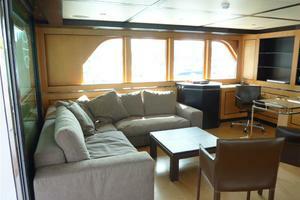 The aft main deck has a large settee that can also be used as a lounge. 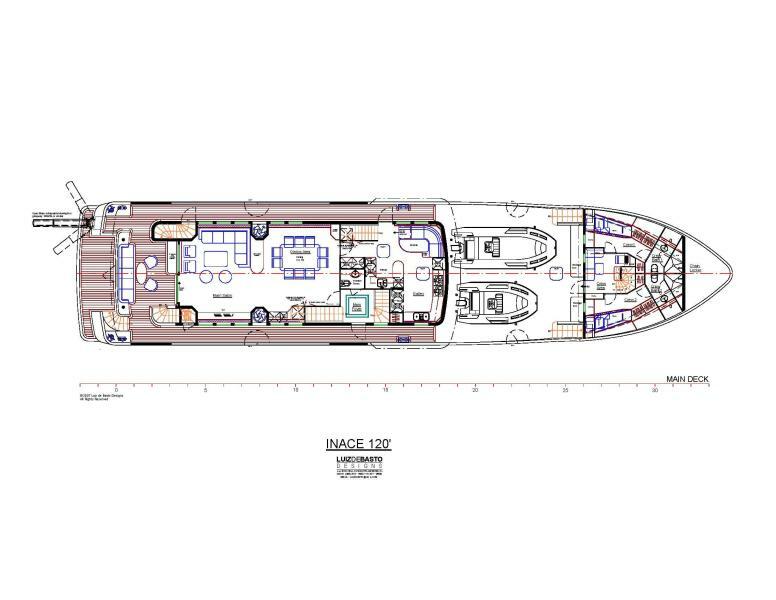 There are stairs up to the flybridge deck, to stb aft there are stairs down to the over sized swim platform and lazarette / engine room access, to port aft is access to the gangway. 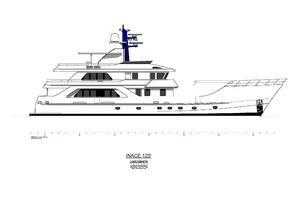 The flybridge is quite large. 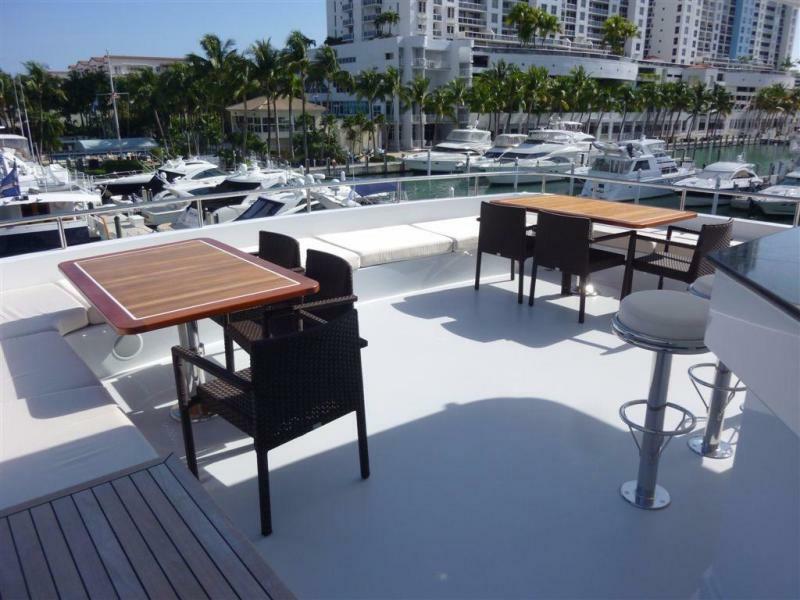 Itis a wonderful private entertaining deck with all of the features you would expect to find on a larger yacht and more. 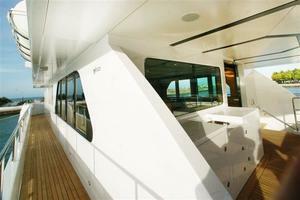 The open rails aft create great viewing from the seating area . 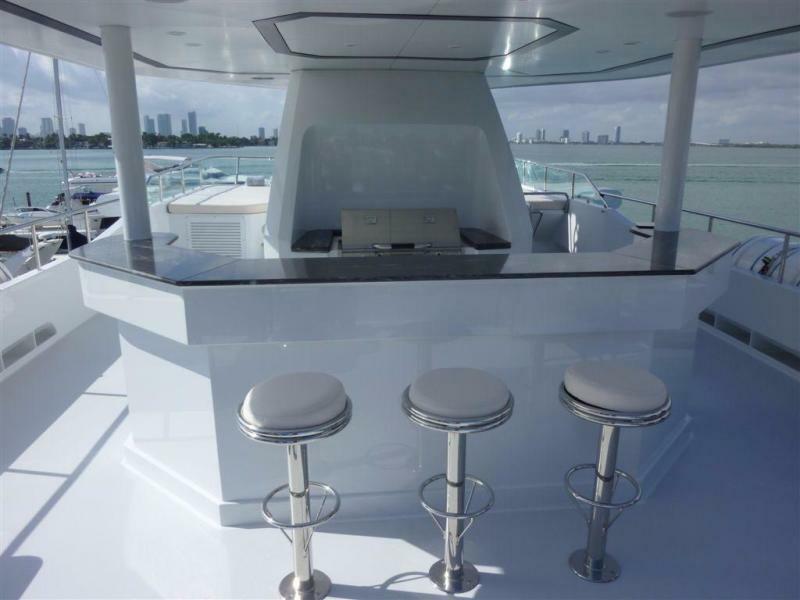 There is a full wet bar with 3 bar stools, under counter fridge and a large stainless steel "Fireboy" electric BBQ located behind thebar. 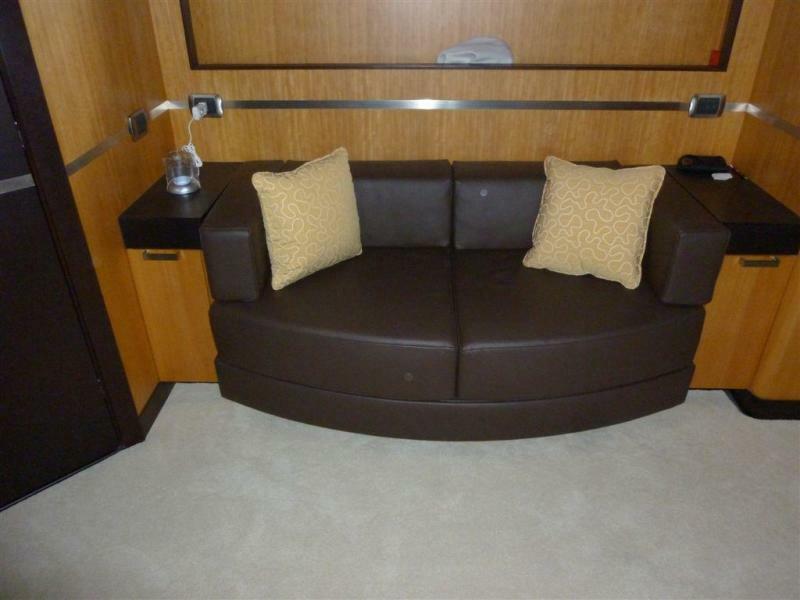 There is built in seating with dining tables that can be lowered to cocktail height.The flybridge has extensive storage under the seating and sun pads. There is a full sound system.The large day head with outdoor shower and another storage locker with full size door is located in the center structure. 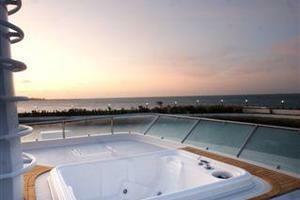 All the way forward is a full size Jacuzzi with over sized sun pad area. 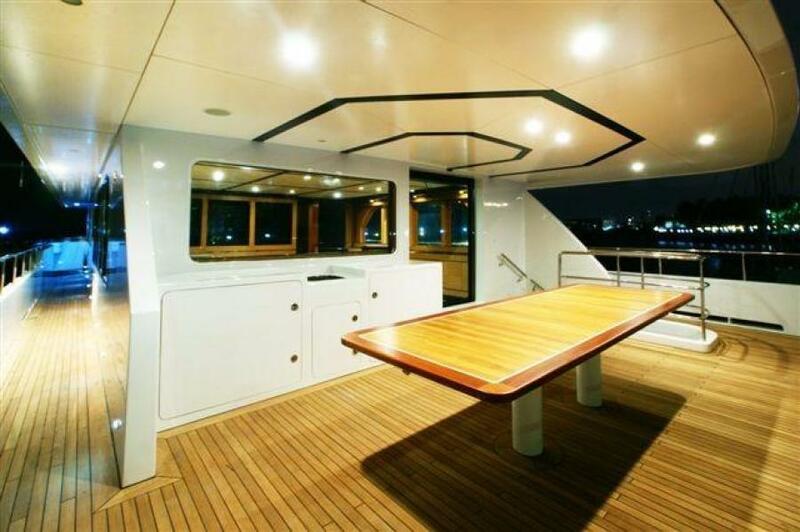 The shade from the hard top can be extended byputting upawnings from the back of the hard top toremovable poles to cover the aft seating and dining tables. 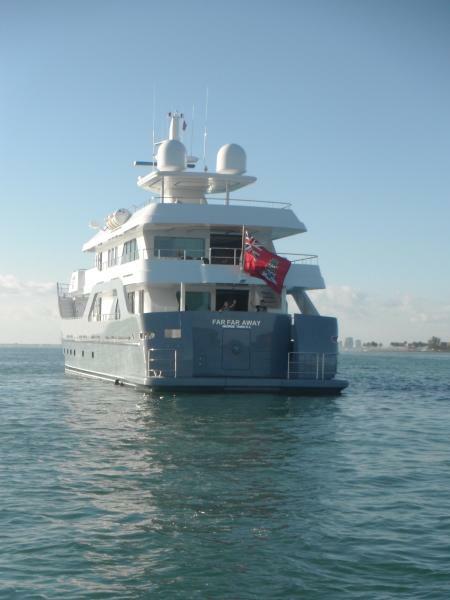 The mast has an integrated ladder to easily service the navigation equipment. The boat deck can carry an extensive amount of toys. 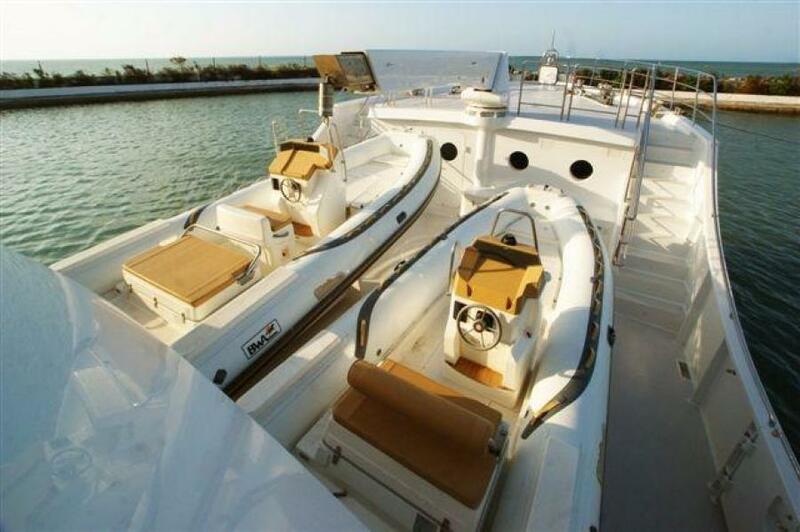 There are two BWA platinum line rigid bottom inflatable tenders, one 6.5m (21' 4")with a 200 hp4 stroke Yamahaand 5.5m (18') with a 115 hp 4 stroke Yamaha. There is a 110 gallon gasoline tank built into the bottom of the larger cradle which gravity feeds to the tenders when they are in the water. 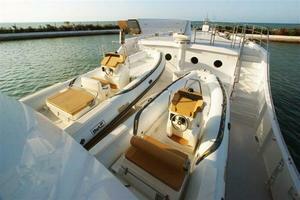 The smaller tender cradle has storage built in under it for MCA gear and other deck items. 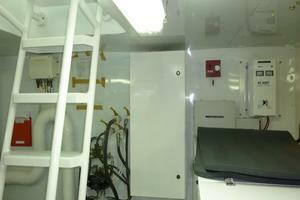 Thereis awater and compressed air station located inalocker on house and storage cabinets at the forward bulkhead. There are port and starboard gates to give access to the tenders while loading and off loading. The main door for the crew's quarters in on the port forward bulkhead, and there isan over hang with drip edge above the door. 2017- competed ABS 5 year inspections.Main Engines:Two (2) CATERPILLAR engines model C-18, B-rated - 600 BHP @ 1,800 RPM, 24V elec. 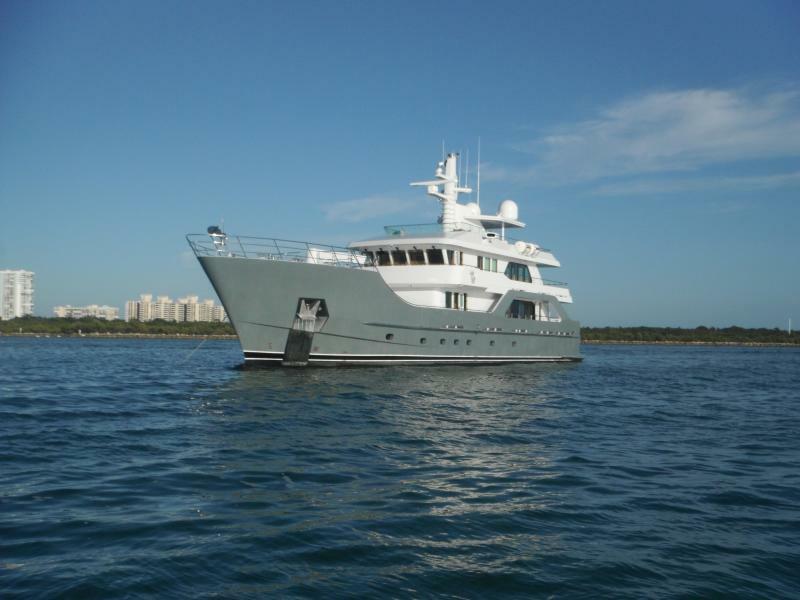 start, lubricating oil filters, dry exhaust manifolds, 24V alarm system, mechanical instrument panel.January 2019:Engine Hours: Starboard - 3484, Port - 3490Reduction gears:Two (2) TWIN DISK Quick shift Mod 5114 reduction gears, 3.50:1 ratio, oil cooler, engine mounted. The gears a have power take off systemto feedthe Bow Thruster, windless and crane and integrated to the Quantum marine power pack.Generators:Two (2) KILO PAK 50 KW @ 1800 rpm, 400/230 V, Three phase, 50 Hz with double mount system, fiberglass sound shields and gas-water separators2019: Generator Hours.Starboard: 6800 hours. 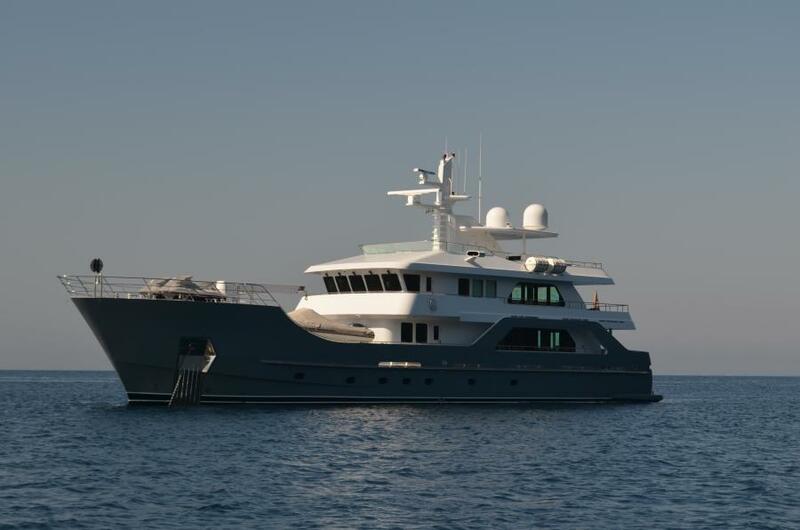 Port: 6760 hours.Propellers:One pair, one (1) R/H and one (1) L/H, Bronze, of 5-bladeExhaust:Engine exhaust manufactured by CENTEK with exhaust lines looped up from the engine and water injected at a high point on the downward side of the piping before the muffler. 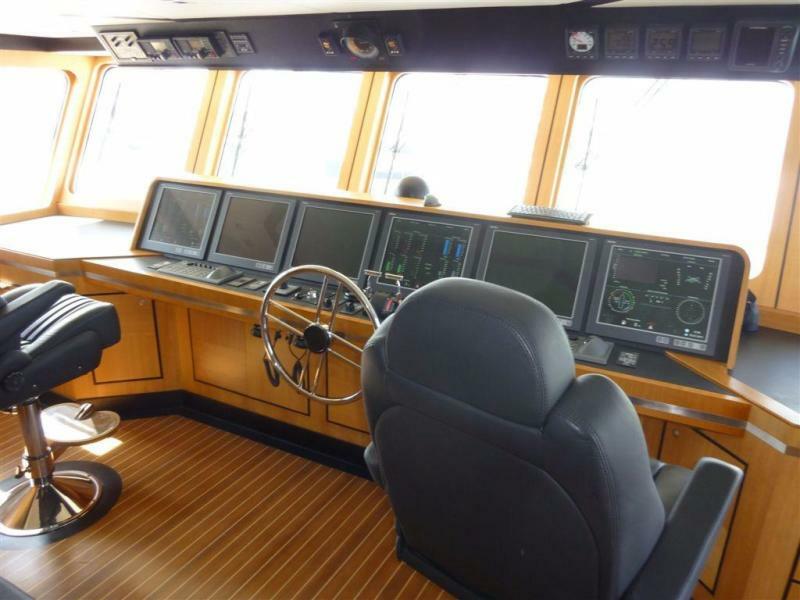 None the exhaust is hung from the over head of the engine room.Engine controls:KOBELT controlswith console mounted control heads installed in the Wheelhouse and at the two wing stations.Steering:KOBELT withthree stations, wheelhouse and two wing stations. Twin steering pumps and twin ABS approved rams. The pump in the wheelhouse is a manual pump and acts as a back up to the system.Bow Thruster:Bow Thrusteris a 20” AMERICAN BOW THRUSTER - 75 HP and is driven off the main engine gears. 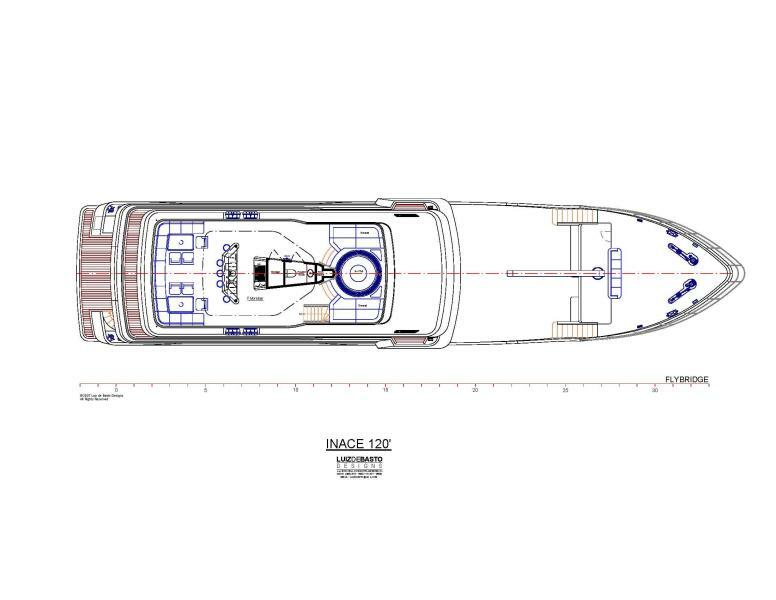 Per manufacturer’s design the system supplies 75 hp when the main engines are at idol.Stabilizer:Quantum marinezero speed fin systemHydraulicsequipment supplierQuantum Marine .The 2-fin stabilizer system, bow thruster, crane and windlasses share the same hydraulic power source. The hydraulic pumps are driven from the PTO’s installed in the Transmission Gears. 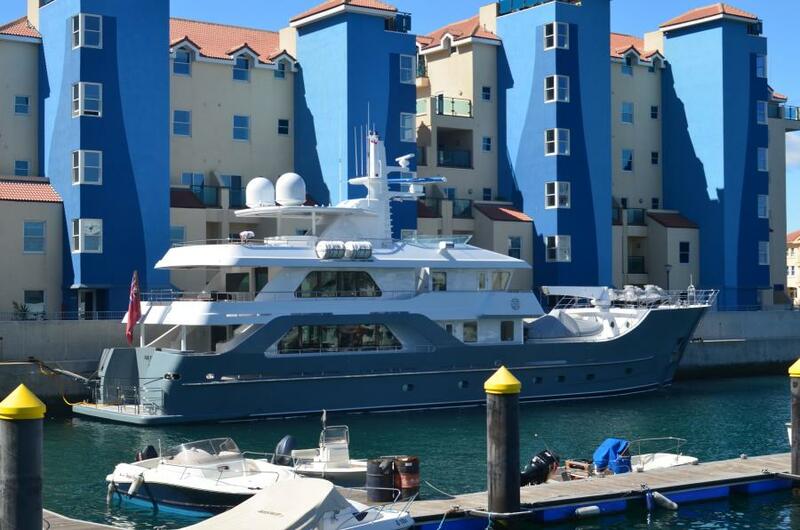 This hydraulic power systemis designed to deliver full power to the vessel's bow thruster and windlasses at main engine idle speed. The system has an integrated manifold to supply proper pressure and flow to the bow Thruster and windlasses.Anchor gear:Windlass and ground tackle are two Maxwell 6000 Lbs windlasses with 450’ of 5/8” High tensile chain on each side ( port and starboard) and 240 Kgs Navy type anchor stored in two polished stainless steel anchor pocket located at port and starboard bow sidesTender Handling:2500 kgs Opacmare Hydraulic boom crane with independent elecro-hydraulic back up systemPassarelle:Opacmare model 5335/40 HydraulicAir conditioning:AQUAIR model A18-3-1 VHD consisting of three compressors with a 18 ton capacity Aqua Air Alpha Series . 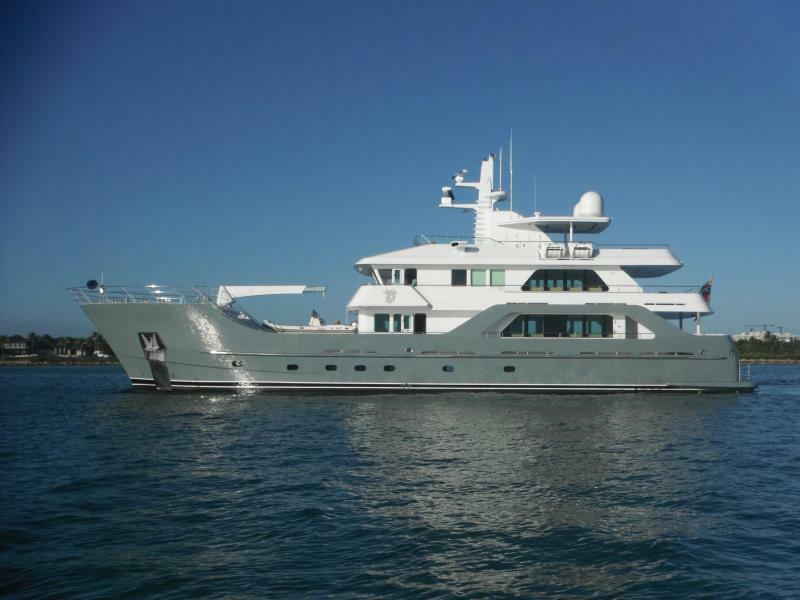 2 x Seawater coolingself-priming pumps – one being a stand-by pump - and thermostats for the fan coil unitsare Tempwise-2000.There is a fresh air makeup system located in the flybridge.Fuel oil System: Fuel oil tanksare integral with the hull, . All tanks are fitted with a sounding tubes or sight glasses and a level indicator connected to the Boning tank monitoring system.The fuel oil system is comprised of a total 17000 gals in (6) tanks, two (2) main tanks, two (3) forward tanks , and one (1) day tank. The day tank holds 1000 gallons.ALFA LAVAL model MIB 303 is installed in the system, it can polish the fuel from any tank and send it to any tank. The system can pull from the two side tanks into the day tank which can over flow back to the two side tanks creating a continuousclean fuel loop which can be operated 24 hours aday. The day tank will run the vessel for 24 hours.There are 4 ways of transferring fuel around the vessel.Amanual pump.Ahigh speed ACfuel transfer pump that can transfer fuel between all of the tanks.A24 vt Fuel transfer pump that can transfer fuel between all of the tanksThe Alfa Laval system which can transfer fuel between all tanksA digital flow meter totalizer is installed in the transfer line.Fuel filters for the main engines are conveniently located under the work bench with drip tray piped to waste oil tank. Both main enginesare fitted with duplex RACOR filters. 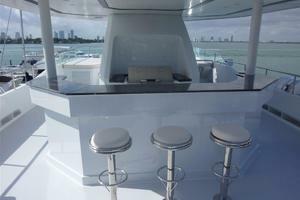 The generators have single filtersEach engine has RACOR fuel filter, Mod. 75900MAX30 Each generator has RACOR Mod. 900MA30 single unit.Drip trays are provided for all pumps, drains and fuel filters.Lube Oil system:Two (2) storage tanks, one for clean lube oil, the other for waste oil. Each tank is 120 gallons Seawater system:(2) two sea chests in the engine room using 8” pipe, combined service plus a 30% overage for downstream piping losses. A Removable filter screen is located in the sea strainers pipes. The tops of the pipesare above water line for easy filter removal. 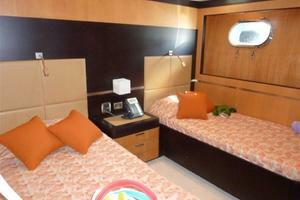 The sea chests are fitted with blow down valves from the compressed are system. 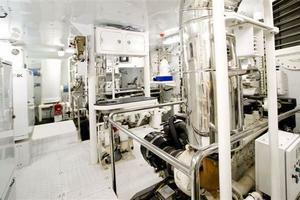 Each pipe can be isolated and cleaned while the vessel is under operation. The bottom grates can be removed in the water to clean the system from the bottom if needed.The seawater is supplied to the system via the crossover pipe that is equipped with shut-off valves. The cross over pipe is ofsufficient diameter to supply adequate water flow at full usage, with only one suction open. The cross over pipe and all raw water feed pipes are CuNi.The sea chest cross over pipe is fitted with a fresh water connection in order to allow filling of the seawater piping arrangement while dry-docked.There are spare values installed in the cross over pipe.Sea chests to have external grills which are to be the removable type to allow cleaning by a diver.Navigation Lights:Aqua SignalEngine room ventilation:Engine room has two fans, one supply and one exhaust. Fanshave Wegvariable speed controls and are separately switched.The systemintake and exhausts are from the pilothouse side decks via a demister system.Fresh water system:There are two pressure pumps on fresh water system piped in parallel with automatic pressure switches to control them, set at slightly different pressures. A large volume Pressure tankis installed downstream of the pumps. The pressure pumps are Head Hunter.The hot water system is branched off the fresh water main line andconsist of2 50Gallons electric hot water heaters. There is a circulating pump integrated into the systemWater Maker:Two FCI 1800 GPD water makers with auto flushBlack water System:Head Hunter toilet systemHamman USCG certified Type II MSDBlack water tank:The tankis fitted with one (1) diaphragm pump actuated by a high and low level switches which also actuate an indicator lights and an audio alarm, (no automatic pump out).Gray Water system:The tankhas a diaphragm pump of the same model and make of the Black water pump and is fitted with two (2) level switches (high and low) to control the sump pump. Operation to be automatic, with an override switch to permit manual operation. The gray water pump discharge directly overboard below the waterline,The gray and black water pumps are integrated to back up each other.Sinks and showers have individual water traps and drain to the gray water tanks. Air conditioning condensate and refrigerator condensate pans from chill and freeze boxes drain to the gray water tank, through a common drain pipe with appropriate water traps. Compressor air system:Theair Pro-Puma aircompressor handles the Quad air horns with auto fog system andhas outlets located in the engine room and on the boat deck.FIRE, BILGE AND ANCHOR WASHThe bilge system includes two large bilge pumps and one (1) diesel driven pump located in the lazarette one of the (1) 230 VAC electric pump located in the E/R, is connected to the bilge manifold. In addition, there will be seven(7) submersible pumps, one in each compartment.The submersible pumps discharge directly overboard through vented loops high under the DWL and have float switches for automatic operation and manual override switches. 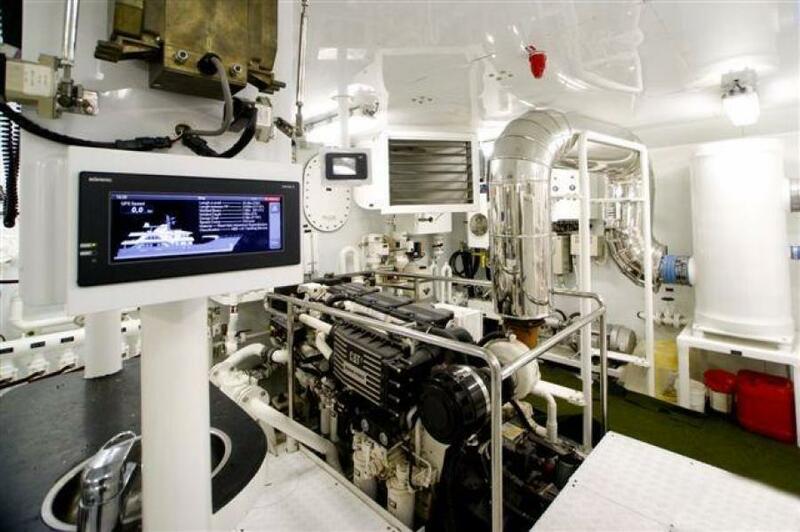 The engine room submersible pump is not be automatic.All bilge suctions are connected to the bilge manifold, located in the engine room. All suctions have strainer boxes and check valves, that are easily accessible.The fire mainis pressurized by the electric bilge/fire main pump, located in the E/R, which then draws from the main sea chest in the E/R. 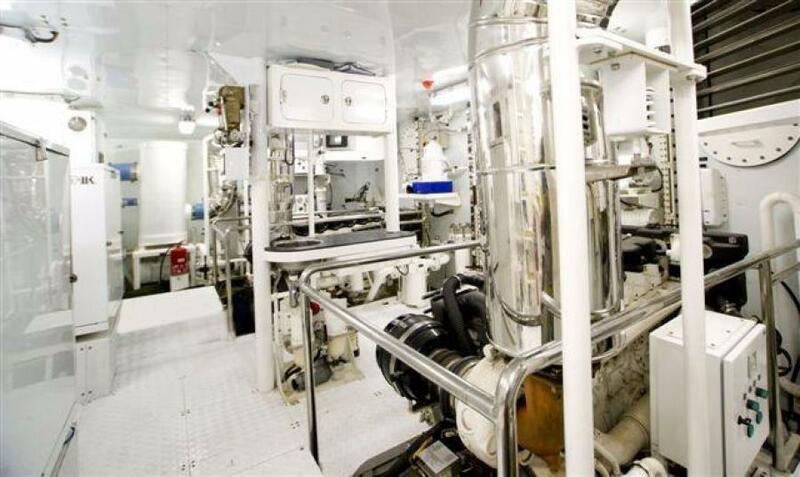 There shall also be a crossover pipe from the pump to the E/R bilge manifold.The fire main runs outside the engine room and feeds the three (3) fire stations located throughout the vessel and the forward located anchor wash. 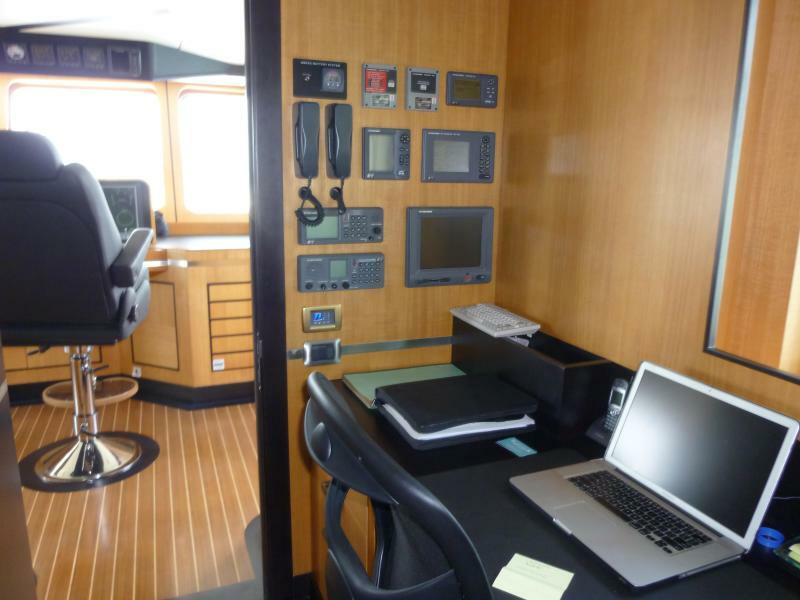 The fire stations are located as follows Forwardlocker under Portuguese bridge Main deckportside at galley entrance door Engine room entranceThe Anchor wash has four (4) nozzles in the anchor hawses and a deck connection at the foredeck forward locker. 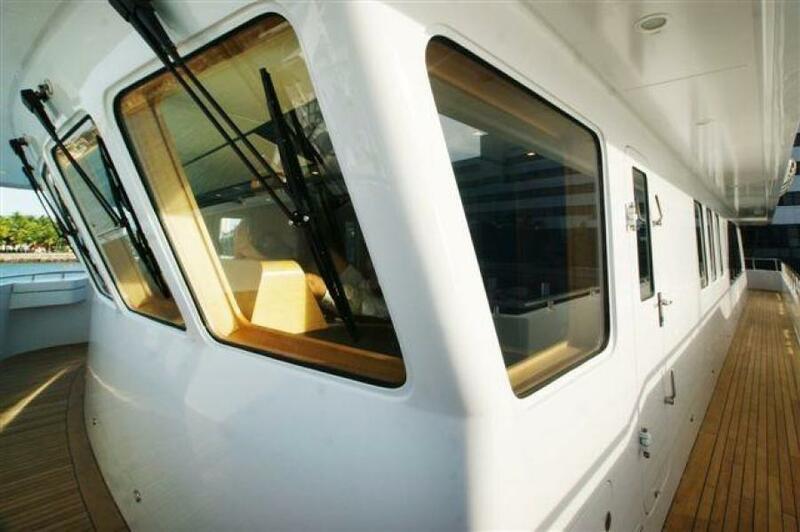 Each anchor wash outlet shall have separate valves to regulate the flow.All bilgesare fitted with low and high level alarms and connected to a monitoring panel located in the wheelhouse, whichincludes audio and visual alarms. The engine room has repeaters for high and low bilge alarms. AC system is 380/220 volt AC, three phase + ground (4-wire), 50 Hz system There is an Atlas 60 kva power converter, the system has auto start and seamless transfer.There are two 100 amp shore power cords each with a Glendening cable system.There is an Englehard Industries Capac meter installed in the system. The hull is protected by zincs. 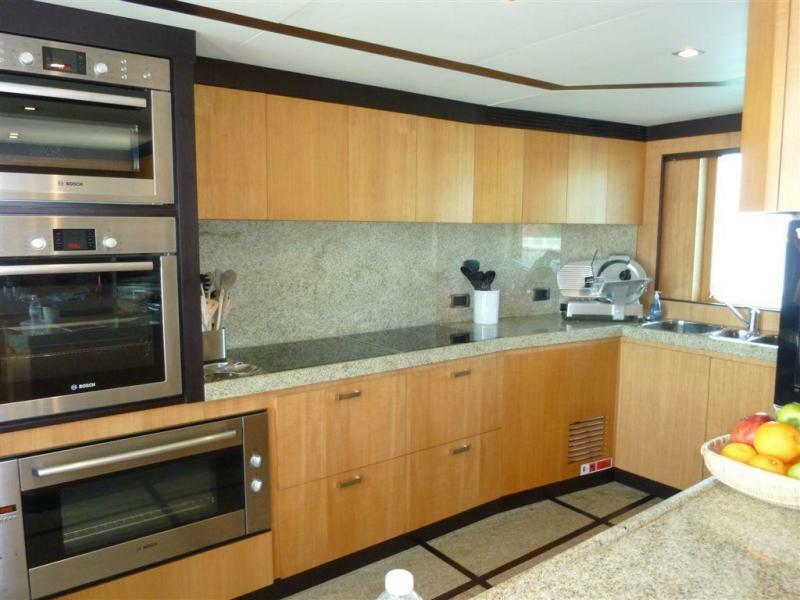 The large engine room is set up for extensive world cruising and very well laid out with excellent access to all equipment. There is a centerline work bench with sink and non conductive top with storage cabinets above. The main Racor filters are located under the bench with drip tray and drain to dirty oil tank; they are easy to inspect and service in all conditions. 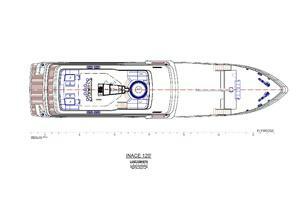 The main engines can be walked around on 3 sides and have comfortable access to the front. 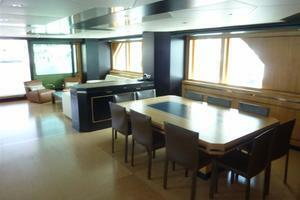 The generators also have very good access from all sides. All equipment is easy to see and service. There are back ups on all key systems. All pumps have drip trays; the air conditioning compressors have a secondary stainless drip tray. 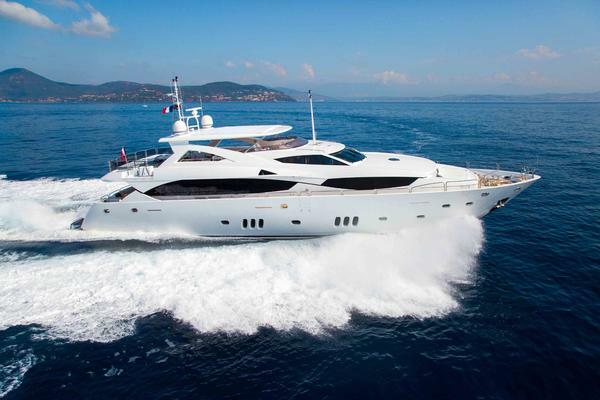 There are lift points over all major equipment.Fuel Burn per Atlantic crossing:1400 RPM Total burn including Genset 90 L/hr or 9.6 L/nm at 9.8, 10 knots Range at 64,000L approx 7000nm1600 RPM Total burn including Genset 140l/hr or 12.5 L/nm at 11 knots. 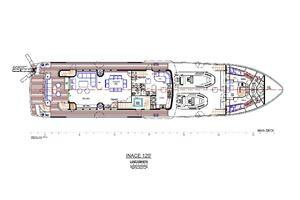 Range at 64,000L approx 5300nm. 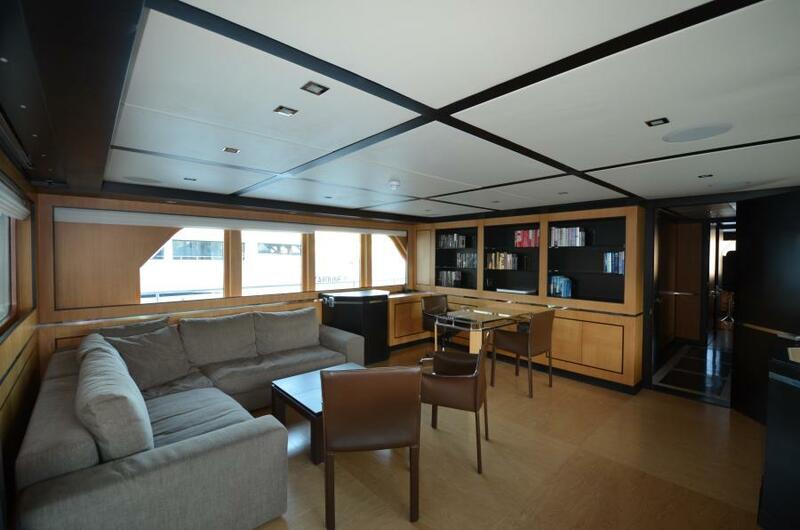 The captains cabin is located behind the wheelhouse and has a full size double bed, hanging locker, drawers and an ensuite headand shower. 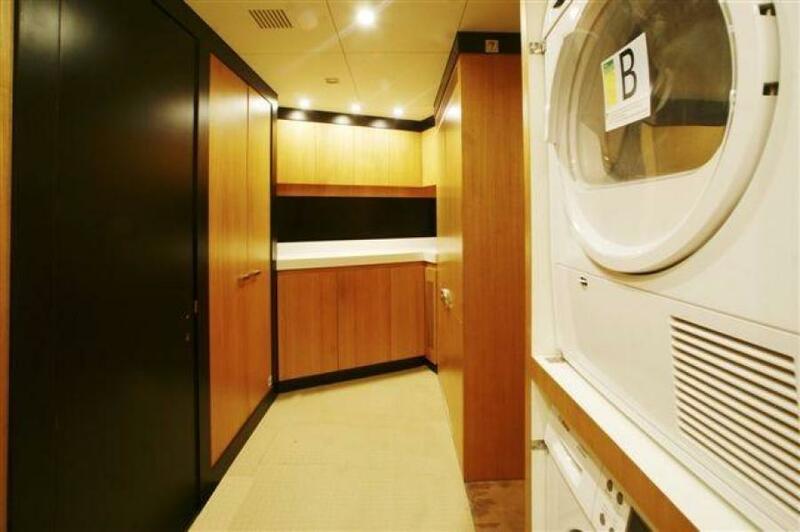 There is a full size laundry with twin Bosch washers and Bosch dryers, extensive storage for linens, dry goods and other storage. The Laundry connects directly with the lower guest area to allow service of all cabins. 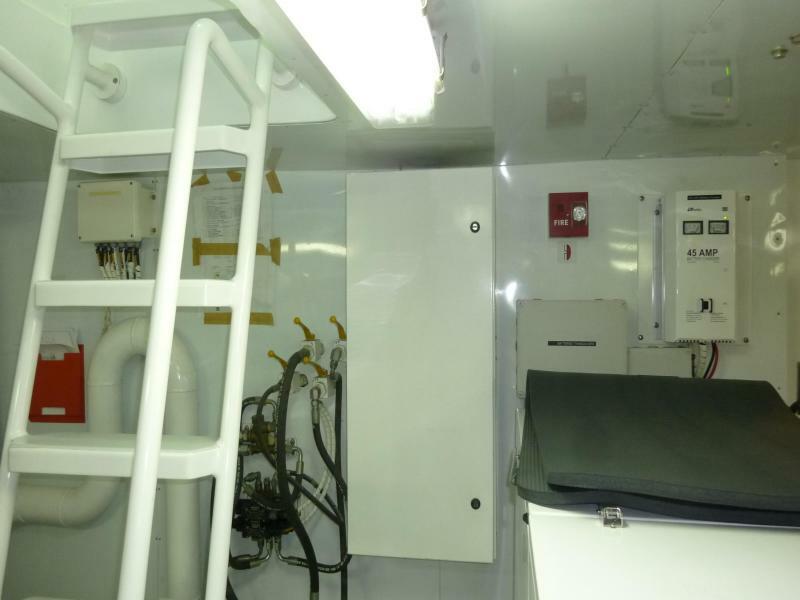 There are also 2 Bosch refrigerator/ freezer units The hydraulics for the crane and windlasses and bow thruster are also located in this area and can be inspected via a clear panel at the back of the ironing board closet and are easy to access for service. 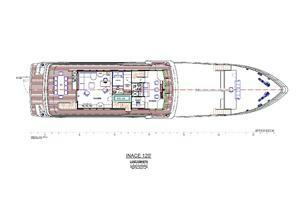 There is a dedicated large luggage locker and storage under the floor. 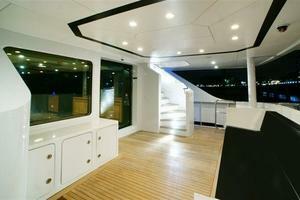 There are stairs up to the forward crews quarters.